Monthly Dial-A-Ride Bus Passes are available for all areas. Local pickup is available Monday-Friday from 8am to 5pm at the ESTA Bishop Office (703 Airport Road). You must select a date at a minimum of 24 hours from now! This pass will be valid for 30 days from your selected start date. Please specify in which area you would like your 30-day pass to be valid. 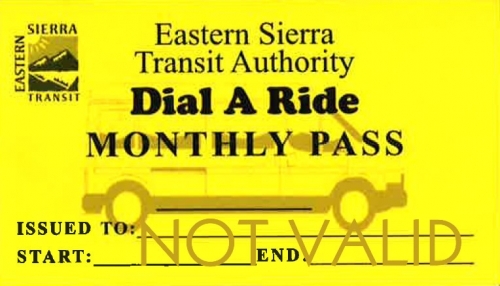 Monthly Dial-A-Ride Bus Passes are available for all areas. Discount fares are available to riders age 60+, individuals with disabilities, and youth under the age of 16. Adult fares are charged to non-disabled passengers age 16 to 60. Children under age 5 ride for free when accompanied by an adult.